Applying Advantage flea control to your feline friend is fast and easy. There are two convenient package sizes which offer flexibility in dosing. Follow the instructions below to provide flea control for your purr-fect companion. Advantage for cats should not be used on any other type of animal. Always consult your veterinarian prior to application. Use only on cats. Do not use on other animals. Remove one applicator tube from the package. Hold applicator tube in an upright position. Pull cap off tube. Turn the cap around and place other end of cap back on tube. Twist cap to break seal, then remove cap from tube. Part the hair on the neck at teh base of the skull until the skin is visible. Place the tip of the tube on the skin and squeeze the tube to expel the entire contents of the tube directly on teh skin. Do not get this product in your pets eyes or mouth. The product is bitter tasting and salivation may occur for a short time if teh cat licks the product immediately after treatment. Treatment at the base of the skull will minimize the opportunity for the cat to lick the product. In case of a severe flea infestation, retreatment may be necessary earlier than four weeks. Do not retreat more often than once every seven days. After flea control is attained, return to a monthly retreatment schedule. Applying Advantage Topical Solution flea control to your canine companion is fast and easy. Advantage is available in four different dosages for dogs and puppies 7 weeks and older, which your veterinarian will determine based on your dog's weight. Advantage for dogs should not be used on any other type of animal. Always consult your veterinarian prior to application. Use only on dogs. Do not use on other animals. For Dogs up to 20 lbs - The dog should be standing for easy application. 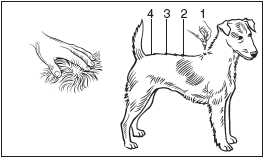 Part the hair on the dog's back, between the shoulder blades, until the skin is visible. Place the tip of the tube on the skin and squeeze the tube to expel the entire contents directly on the skin. Do not get this product in your dog's eyes or mouth. For dogs 21 lbs and over - The dog should be standing for easy application. The entire contents of the Advantage tube should be applied evenly to three or four spots on the top of the back from the back from the shoulder to the base of the tail. At each spot, part the hair until the skin is visible. Place the tip of the tube on the skin and gently squeeze to expel a portion of the solution on the skin. Do not apply an excessive amount of the solution at any one spot that could cause some of the solution to run off the side of the dog. Do not get this product in your pet's eyes or mouth.